Sneak Vodka in Hidden Flasks – Great Gifts! Are you looking for a way to sneak your vodka on board to drink during your upcoming cruise? Want a better way to sneak some vodka in to the upcoming football game or other sporting event? Look no further as hidden flasks have come a long way! No one with think to check for vodka hidden in a “lotion bottle”. We have listed our recommended hidden flasks below. These sneaky flasks make great gifts as well! Shampbooze Deluxe is even more discreet than the original Shampbooze bottles! Now the hidden flasks feature flip top lids as well as leak proof seals! This 2 pack of hidden sunscreen flasks hold 8 oz each. These flasks are made of food grade safe materials and are a sure bet in sneaking vodka on board a cruise or in to a sporting event! Fill up these sneaky flasks easily with the included funnel! This 3 pack of “lotion bottles” are made of food safe plastic and each bottle holds 4 oz of liquid. 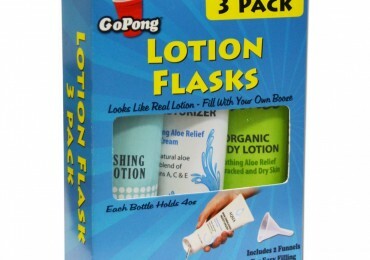 Easily sneak your vodka in to a sporting event disguised as lotion! This kit also comes with funnels to make filling the bottles easy with no spills! Shampbooze comes in a two pack of 16oz bottles offering a total of 32 oz of flask space. This product works great for sneaking vodka on to cruise ships.